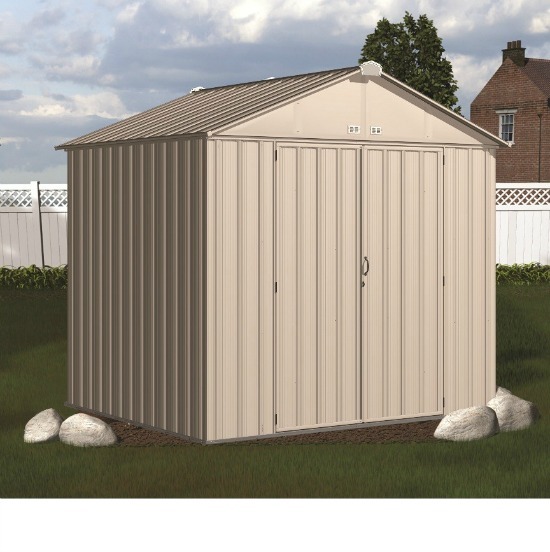 Introducing the EZEE Shed from Arrow Storage Products a shed that builds in half the time. 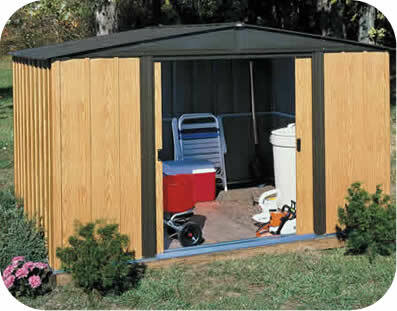 Introducing the EZEE Shed from Arrow Storage Products a shed that builds in half the time. 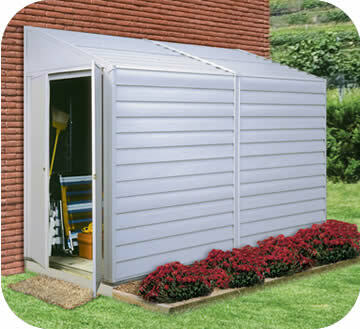 The EZEE Shed is a galvanized steel shed that is durable and made to last. It features the revolutionary Snap-IT Quick Assembly system that cuts assembly time down by 50% compared to most steel sheds on the market today. The EZEE Shed has a reduced number of fasteners across walls, roof, and doors so assembly is faster and easier! 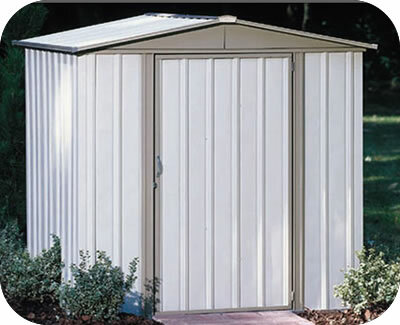 The EZEE Shed features a design that is 2x stronger than leading steel sheds on the market. Its unique panel geometry is more impact resistant, and with its overlapping Snap-IT panels that connect every 12 in., it boasts a stronger overall building design. The EZEE Shed also features improved roof assembly that allows for ground assembly of the roof for easier and faster roof attachment. The EZEE Shed is not only a tougher shed with faster assembly, it's a more modern and attractive take on outdoor storage sheds, too! The EZEE Shed is available in an updated color pallet that makes it a modern and stylish storage solution for backyard, patio, and garden areas. 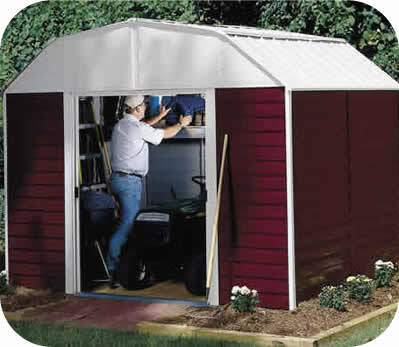 The EZEE Shed doesn't just look better; it offers better storage space, as well. The EZEE Shed's attractive swing door design allows for easier access to your items and features a heavy duty framed out design. The doors are set on 3 hinges for extra durability. The EZEE Shed is a strong and modern alternative to your standard backyard shed, and the next step up in steel shed assembly and design. Speed up the assembly process with Snap-It™! With up to 50% fewer fasteners compared to standard Arrow sheds, the EZEE Shed® assembles easily in up to half the time. Bonding for a Stronger Shed. 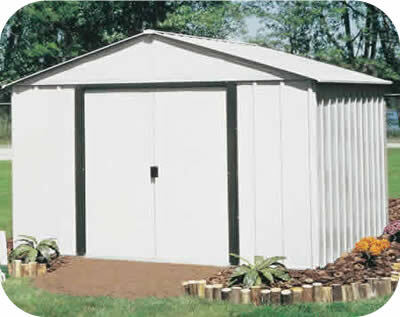 This 100% galvanized steel shed is built strong and features the Snap-It™ assembly system’s unique bonding method which strengthens the unit for a stronger shed. Stylish Design in 4 Color Combinations. Unit is available in a stunning array of new color options including Cream, Charcoal, Cream with Charcoal Trim and Charcoal with Cream Trim. High Gable Roof and Vents. Gable vents improve ventilation and air circulation within the unit. The roof is assembled on the ground for faster, easier roof-to-wall attachment. Pad-lockable doors to secure belongings. 74 x 30.3 x 5.5 in.